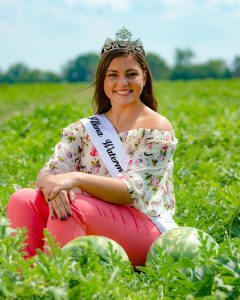 Each year we hold our Illiana Watermelon Queen Contest at our annual Watermelon Convention. 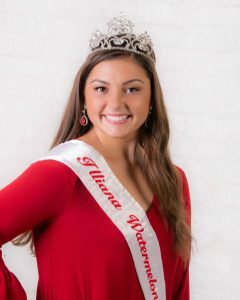 The winner of this year’s 29th Annual Illiana Queen Pageant is Miss Brilee Albrecht. After receiving training in Atlanta, Georgia with the National Watermelon Promotion Board, she will be busy attending the various promotions throughout the country. 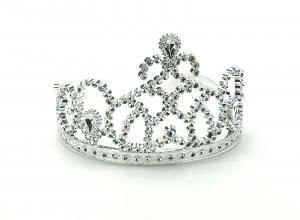 We would love to visit your special occasion or promotion. To book a promotion, call Lana Brothers, our promotions coordinator at 314-724-6305 or email her here. Our thanks to all the contestants who participated in this year’s contest. They all did a very fine job. Any one of the contestants would have made a fine representative for the Association. LEARN MORE ABOUT OUR QUEEN PROGRAM! Marine Corp Marathon – Washington D.C.
Each year we select a new IWA Watermelon Queen at our Annual Watermelon Convention from a slate of candidates from across our district. She will become a Promotional Ambassador for our association for the upcoming year. She will make appearances at Welcome Centers, County and State Fairs, Supermarkets, Parades, Festivals, Schools, TV Interviews, and many other functions as scheduled to promote the watermelon industry. 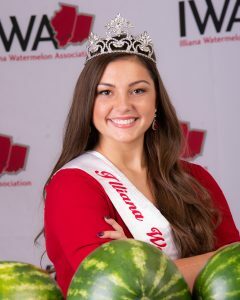 Upon completion of her tour as the Illiana Watermelon Queen, she will represent our chapter in competition for the title of National Watermelon Queen at the following year’s National Convention. This is an application process and not a beauty contest, although how a candidate presents herself is an important part of representing our association. 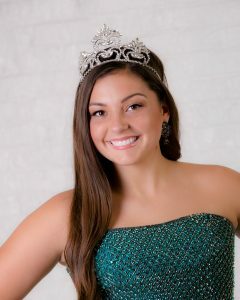 If you think you or someone you know is interested in participating in our queen contest, you may contact Lana Brothers by sending an email to this link here. You, too, can be a contestant!